Anew Fritz!Box is a terrifying thing to review, not because of any Axis power-based name-calling or fear of boxes going on the fritz (hoho) but as they do so much. In the big scheme of things this is the little brother of the high-end Fritz!Box 7390 but foregoes the 5GHz networking. 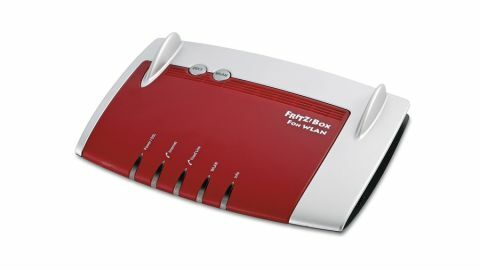 This Fritz!Box 7360 is a SOHO-class communication hub. We call it that as it's no ordinary wireless modem-router. Beside the usual 802.11n 2.4GHz 300mbps wireless, the ADSL2+ modem and four Gigabit LAN port, there's a host of additional communication tools. It can tie into up to six DECT phones, acting as a low-cost PBX. It also offers SIP-compliant VoIP telephony, can take a fax attachment and offers answer phone capabilities with call diversion. Throw in twin USB ports for NAS and UPnP-AV capabilities and you have something that raises the game above what most home users expect. Without doubt AVM knows how to put an amazing bit of routing technology together. Our main concern is that much of it is mostly of interest to SOHO installations; we're looking here at the fax, phone and DECT integration. The VoIP and phone diversion capabilities that tie into an available iOS and Android app are very clever (despite a few usage issues). With its ADSL2+ capabilities there's no reason why you could put it to full use, as it'll be sat near your main phone line. As with all Fritz!Box products installation is easy enough with an excellent web interface. It's probably a little complex for the novice, but the Expert mode most definitely pleases our desire for comprehensive settings and information. Its integrated live bandwidth and frequency graphs are pretty impressive with it having an energy-saving section and some excellent easy-to-understand logging. We're disappointed by the 100BaseT ports though, it just seems pointless at this stage of the game. While it does lack 5GHz band-support, we imagine for many this isn't an issue and the bonus is that the 2.4GHz throughput is amongst the best we've tested and, in fact, the best with middle-distance tests. Two USB ports for NAS and printer support are good to see, but these are greatly hampered by awful speeds as low as 5MB/s, which do seem to be endemic. It supports IPv6 routing and provides basic schedule-base access. The lack of 450mbps or 5GHz wireless could put off those that want the bleeding edge but as there's so little support for them right now, for the rest of us the best 2.4GHz 300mbps performance will usually do. We'd also expect four full Gigabit LAN ports and the odd provision of two just isn't good enough. AVM though has obviously spent a lot of care on its web interface. This does make it a pleasure to use and provides comprehensive features. What it does do, it does very well: the 2.4GHz 300mbps wireless offers some of the best speeds we've seen and there's no doubt there's nothing on the consumer market to touch this comms hub.